This project in progress consists, at the moment, in three participatory and interactive performances, and of the derived artworks as videos, installations and photos. All the works are about refugees and focus on issues as of acceptance. 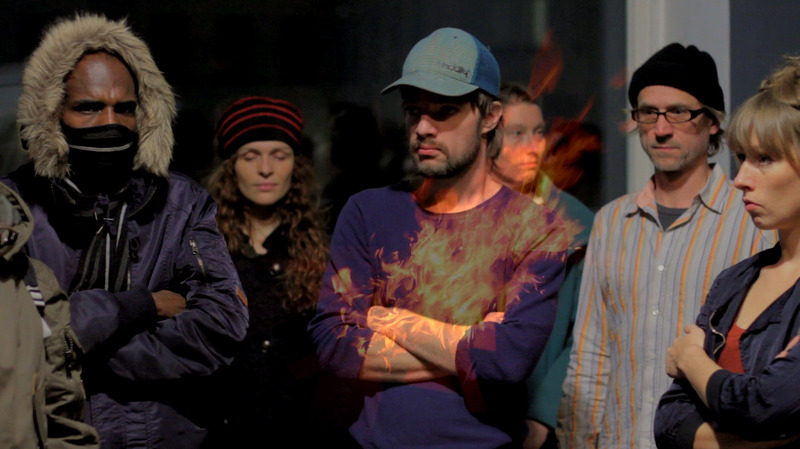 The first work is an interactive and participative performance titled ‘REFUGEES WELCOME’. This was performed at Kreuzberg Pavillon in Berlin on December 14th, 2013 and on November 14th, 2014. The second performance titled ‘YOU’RE OUT‘ is a collective and participatory performance for a group of refugees and citizens. Structured like a game it was first played in Oranienplatz (near the refugees information tent) in Berlin on November 16th, 2014. 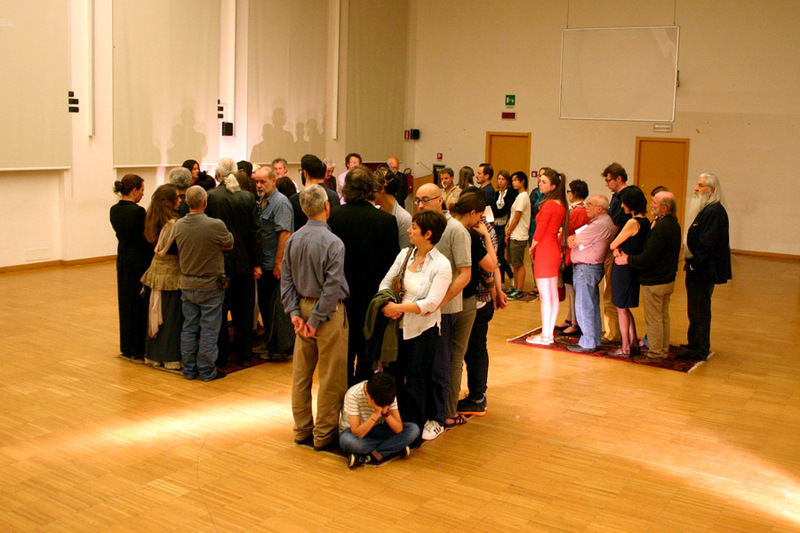 The third performance, ’WITH NO TIME’ was presented at the Urban Center of Monza on Friday May 29th 2015 for ART ACTION 2015-12° International Performance Art Festival and, on a new version, at the Opening of Arte Fiera 2016 in Bologna. 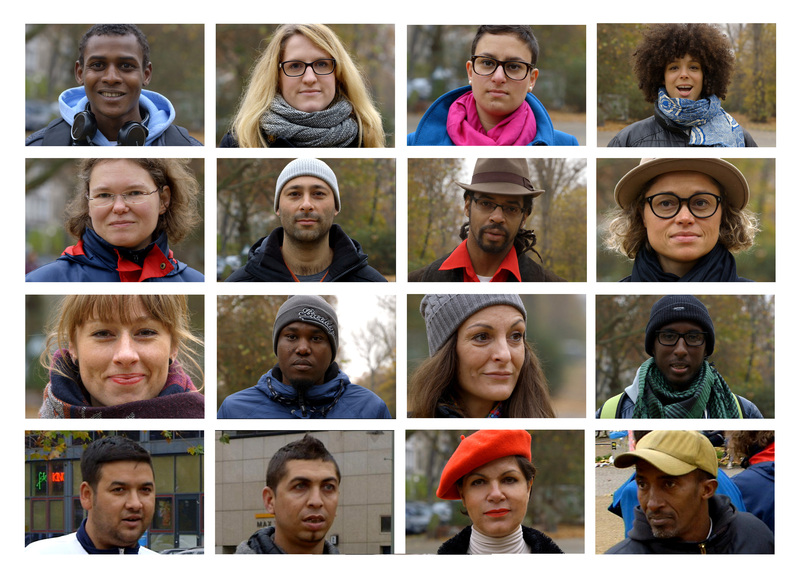 ‘Refugees welcome‘ is a participatory performance project made with and for refugees people in Berlin. 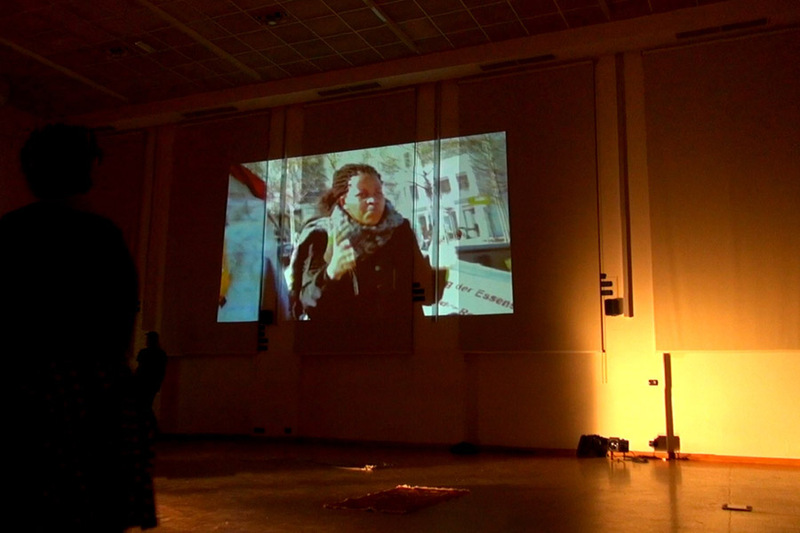 It consists of three parts: the collective performance itself at the gallery; the previous site specific work in meeting and getting to know refugees people and their problems; the creation of a videowork. The video puts together the results of backstage and of the performance. It’s an autonomous work which focuses on the concepts and feelings of dignity, equality and acceptance. This work is dedicated to the refugees, to their stories and for their rights. It is dedicated to all the people who have to leave their home country and have to rebuild their lives elsewhere. 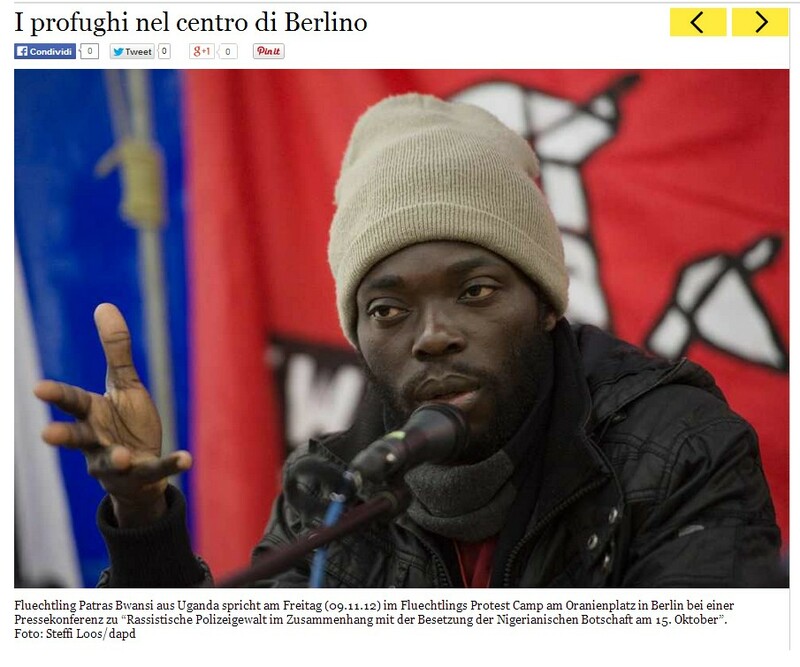 “I arrived in Berlin at the end of 2013. At that time I immediately realized that the problem of refugees, of their rights and of their documents was very debated and visible in the city. 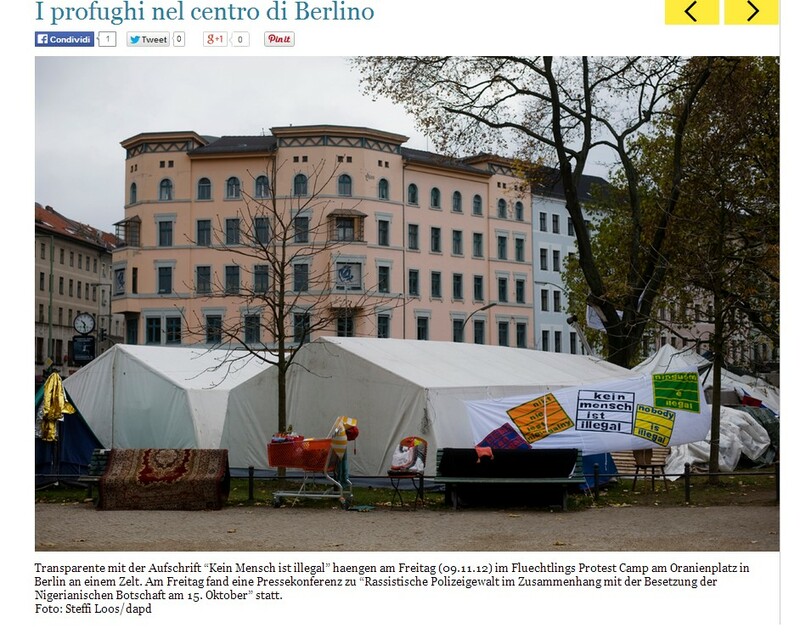 The refugees had erected a tent city in Oranienplatz, a square in the central district of Kreuzberg. When I was invited to present a performance art piece at the Kreuzberg Pavillon, I realized that I was not interested in presenting a work of mine nor in speaking about myself. I wanted instead to give voice and space to the Refugees people and their problems. 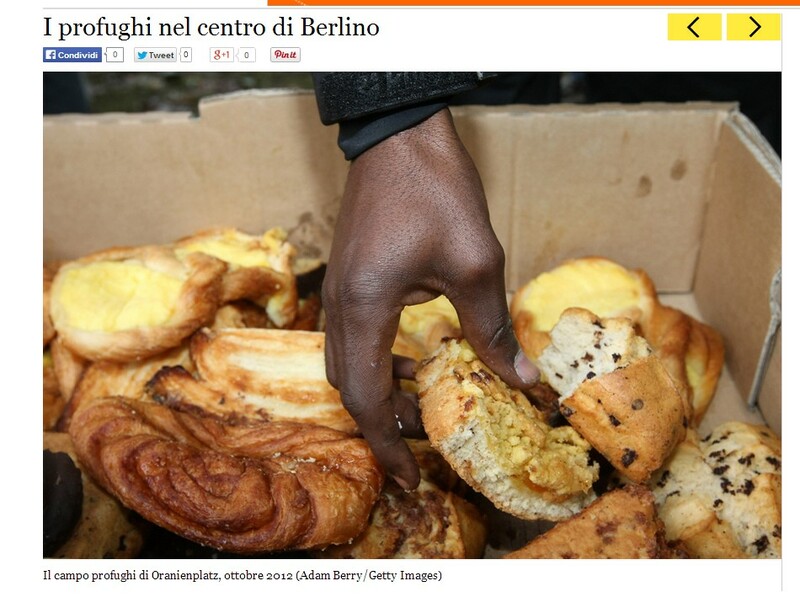 I was aware that the media, at least in Italy, gave distorted information on the whole issue. So I decided, in agreement with the organizers, to invite Refugees to the Art Space and welcome them. With this gesture, I wanted to state that life and problems of people are more important than art. 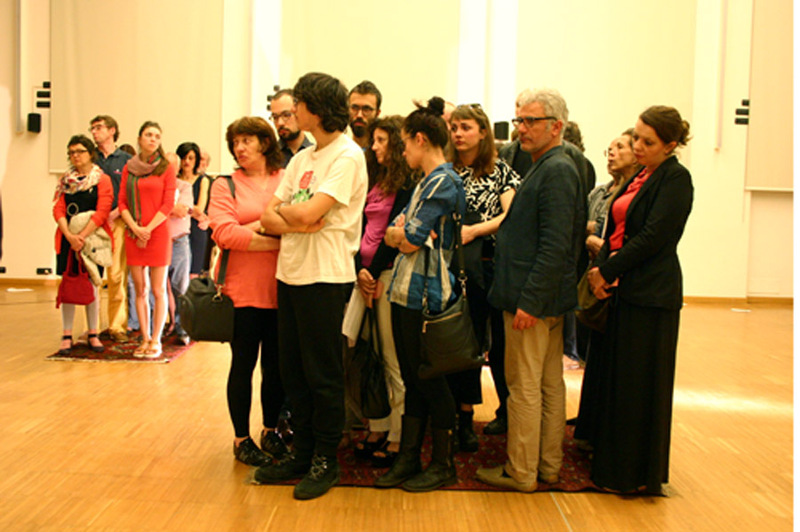 When the refugees arrived to the gallery, LIUBA asked the public to stand for twelve symbolic minutes of silence wherein everyone is connected and accepted within the gallery space. Silence gives way for each person to experience and to remind themselves of being grounded and to think of the life that we all share. I am very touched by the fight of refugees and immigrants for their rights and I want to give them voice through my work in Berlin. I have been invited to make a performance art piece in an art gallery in Kreuzberg on Saturday December 14. 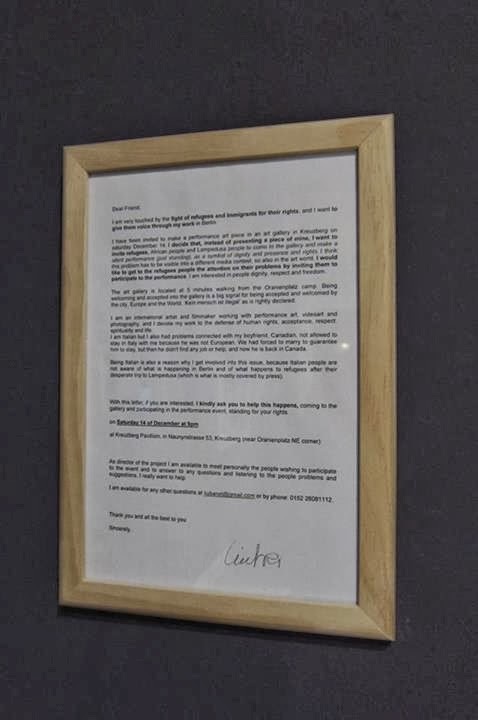 I’ve decided that, instead of presenting a piece of my own, I want to invite refugees, African people and Lampedusa people to come to the gallery and make a silent performance (just standing) as a symbol of dignity, presence and rights. I think this problem has to be visible into a different media contest, so also in the art world. I would like to get to the refugees people the attention on their problems by inviting them to participate to the performance. I am interested in people’s dignity, respect and freedom. According to UNHCR estimates that the refugees in the world are around 11.7 million. The whole of Europe accommodate about 1 million 700 thousand refugees, a number similar to that found only in Pakistan. Most of them are located in Germany, with a presence of 589.737, meanwhile 149.799 are in UK and 64.779 in Italy. 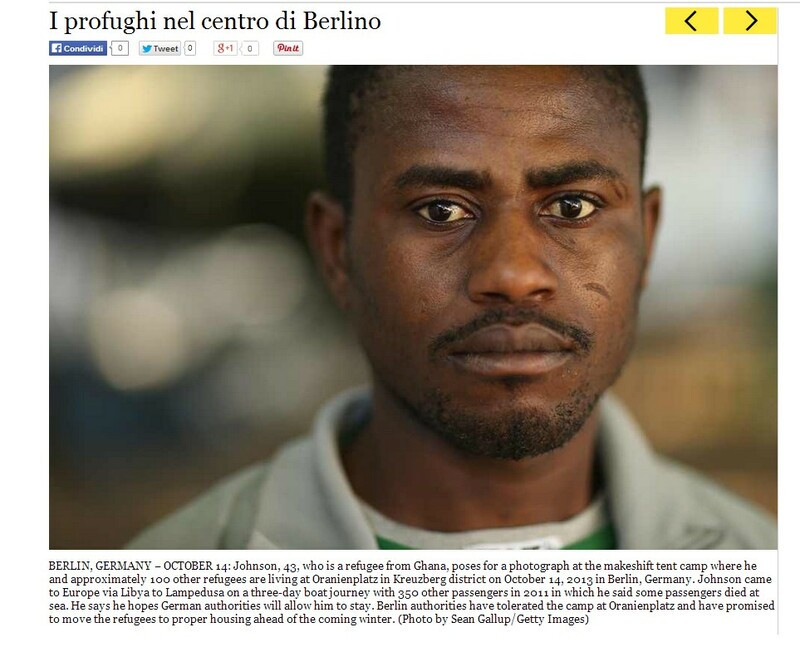 Asylum seeker : is a person persecuted by his/her own country, whom request protection by another foreign country. Each state has to offer protection based on the Genevra Convention of 1951, or according to other forms of international protection. Dublin Convention: In order to avoid mutiple asylum requests and to determine rapidly the Member State responsible for an asylum claim, the European Union decided to standardize the asylum procedure with the Dublin Convention, effective from September 1997. This is based on the principle that the first Member State where finger prints are stored or an asylum claim is lodged, is responsible for a person’s asylum claim. It is clear that in accordance with this regulation Italy, due to its geographical characteristics, has become one of the most affected country as it is no longer able to be just a “transit country,” as it was in previous years. The Dublin Convention caused two paradoxical effects: on the one hand Italy should manage alone all the great arrival flow of refugees, and on the other hand Refugees wishing to go to another European country to look for work, found themselves without valid documents and therefore denied the opportunity to work. Among the many protests for the acquisition of rights, the most visible and numerous were in Germany, in particular in 2012. With the slogans “We are here” and “Kein mensch ist illegal” (No one is illegal), more than 200 refugees from all around the world raised their voices for the acquisition of social and civil rights, building a protest camp in Oranienplatz, a square in the central Kreuzberg district of Berlin, supported by the solidarity of many citizens and some politicians. 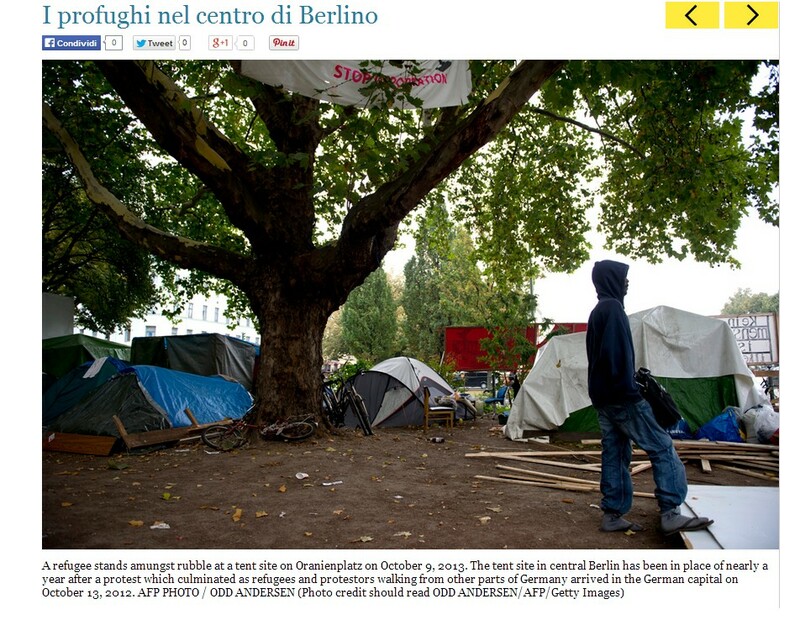 “The camp housed around 100 people from the end of September 2012 until April 2014, when it was cleared. From the dozens of tents that once covered the southern side of the square, only one – an information tent – was allowed to remain, and that was burnt down a few weeks ago. The refugees based there demanded the right to work, the abolition of Residenzpflicht – the German regulation that forbids asylum seekers to leave a certain radius (determined by the administrative county where they applied for asylum) – and assurances that they will not be deported. In short, they campaigned for an existence free of constant uncertainty and the right to be allowed to settle in Germany. The camp came about as a direct result of the suicide of an Iranian refugee in a refugee shelter in Würzburg in March 2012 – a tragic episode that revealed how the denial of such freedoms can be too much to bear for often deeply traumatised people who may have experienced war, persecution or other suffering great enough to drive them to leave behind their homes and relatives. The suicide triggered a protest march from Bavaria to Berlin in the autumn of 2012 – the biggest self-organised refugee protest Germany has ever seen, with more than 6000 people showing their support. 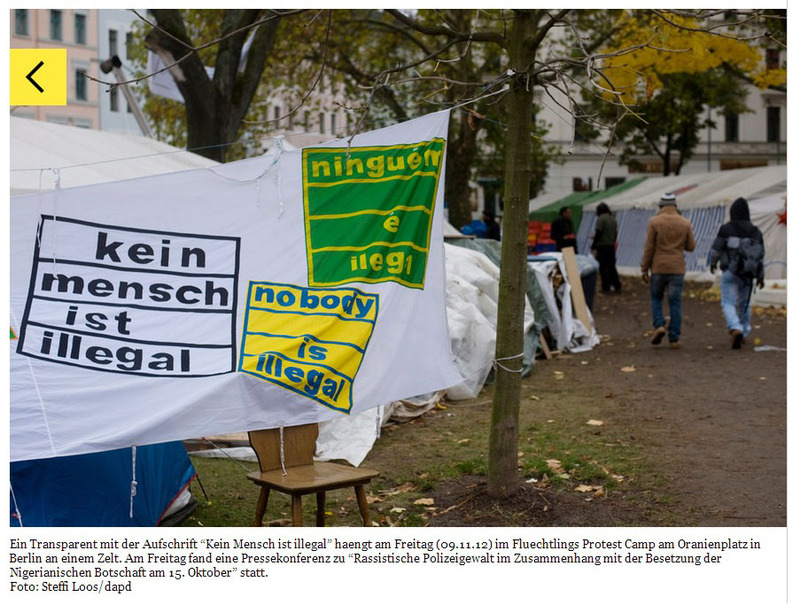 Source: http://www.slowtravelberlin.com/berlins-refugee-protesters/ by Nina Rossmann  Font UNHCR (link al Global Trends http://unhcr.org/trends2013/). -I think that people and their problems are more important than art projects. -I bring people into an art gallery because people and their lives and their problems are really what matters now. -I put together different people in the same space, because everyone has the same right to stay that one space. -I let people stay still. People observe each other. Observing is the first step of accepting and respecting. -I let people look at each other to find the common basis of our existence: being alive now. -I build my performances with the purpose of creating personal experiences for people, inner and outer. -Art as a mean to give refugees a chance to be listened, to be visible, to be respected as their equal right. 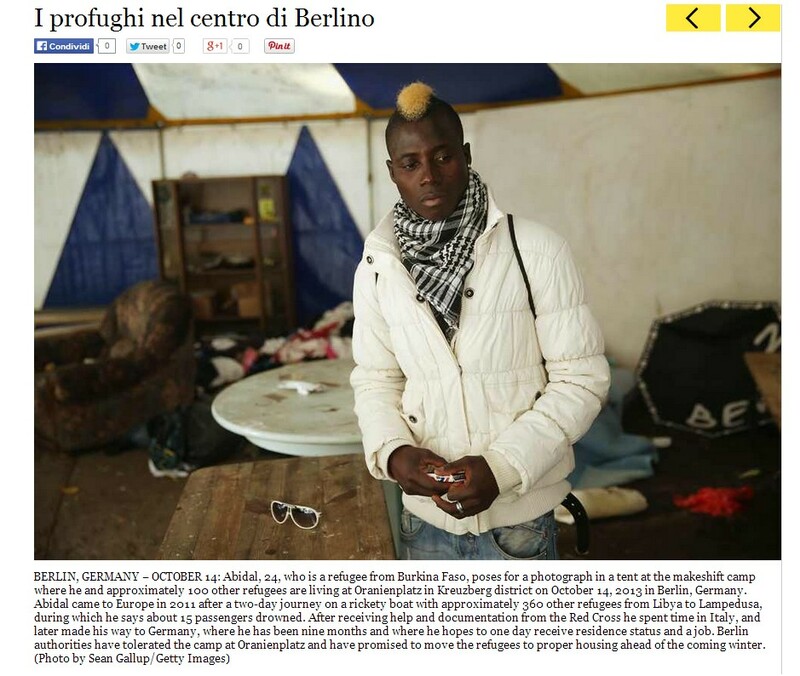 A brief introduction by Italian artist LIUBA on the reasons why she decided to make a site-specific work for giving voice to refugees people struggling for their rights in Berlin. 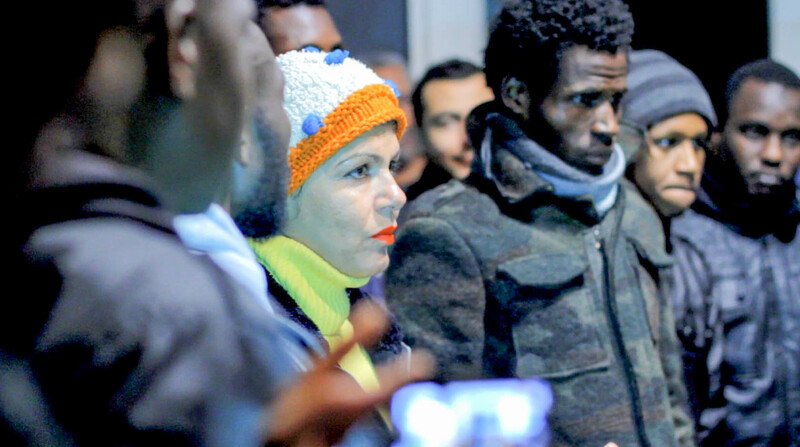 Interactive and collective performance for a mixed group of refugees and citizens with live music. LIUBA continues her work focusing on the European ‘Refugee Problem’ and the struggle for immigrants rights. 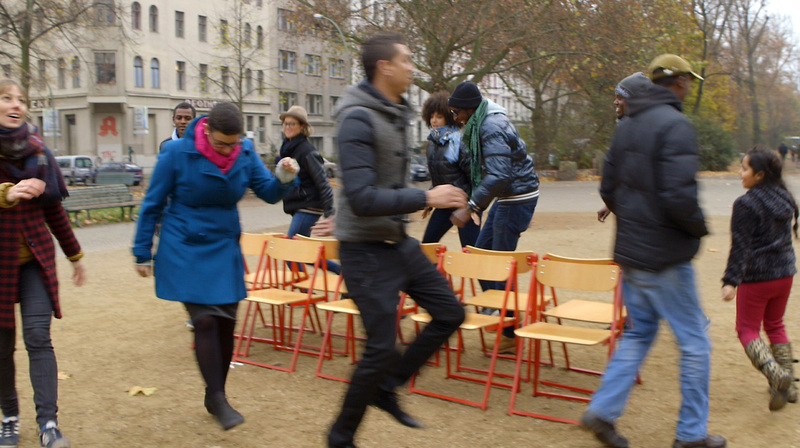 The performance is a public play of the children’s game, Musical Chairs (called Trip to Jerusalem, in Germany). The idea of the performance is to play a game that is symbolically a mirror of what happens in reality: there is not always enough space for everybody. Playing the game allows people to experience first hand the possibility of being refused, the fight against others for finding a place and the feelings connected with that. The performance is conceived to include as participants both refugees and citizens to represent the multiracial society of our times and the problem refugees face when entering a new country and their attempts to integrate. The location where the performance was hold is very important and symbolic too. It’s Oranienplatz in Berlin, where the tent camp of the refugees’ rights protest was held, and the performance is just after the camp being evicted by the police. 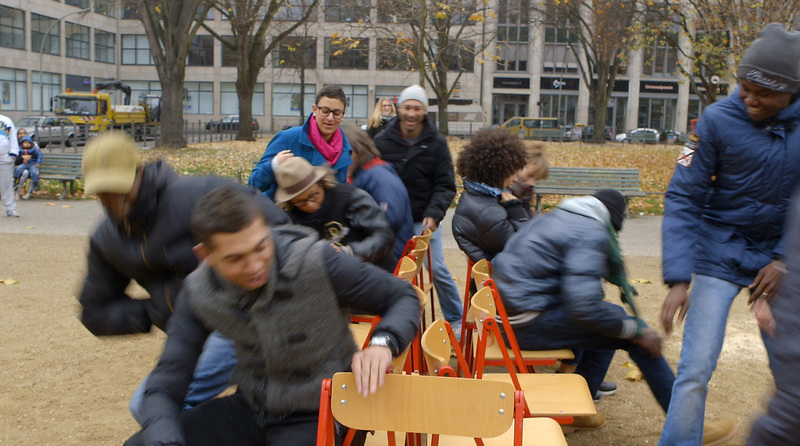 In the game, there are as many chairs as the participants, minus one. When the music is playing people are asked to dance and walk. When the music stops everyone has to find a chair to sit in. Everybody will get one chair to stay, except for one person who will be excluded from the community of the game. The game continues and each time one new person will be expelled, until the end when there will be only one person left, alone in the community. The performance ends with another round of the game for all the participants and with enough chairs FOR EVERYONE. This last time when the music stops everyone will find a place, a chair of his/her own and nobody will be expelled. Everyone will feel comfortable, having a place to stay, not having to fight against others to obtain the right to stay in the community. Video and interactive and collective performance for citizens. This project follows in time and research of YOU’RE OUT, and it is part of the project Refugees Welcome. The performance With No Time involves the public in a direct way, referencing the personal experience of the refugees’ travel conditions on the boats that carry them to Europe. The insufficient, constrained physical space on the boats force the people to stay close together for many hours, with an uncertain arrival. The spectators stay after the screening of the video Refugees Welcome, and experience a parallel condition. The confined, small areas of carpet represent ideologically the spaces of the boats in which the migrants are force to travel. The area of the carpet is insuperable. The audience become the main protagonists of the performance and for 12 minutes they are requested to stay still in silence and stay on the areas of the carpets. The minutes of silence requested are symbolic of hospitality, dignity, and sympathy. Being crowded together on the carpets could lead people to relate to the sufferings, stories and realities of the refugees on these boat trips to Europe. The interaction of the performance may lead viewers to learn directly about the condition and the mood of the refugees during the emigration, involving them in a collective reflection on respect, equality and integration. 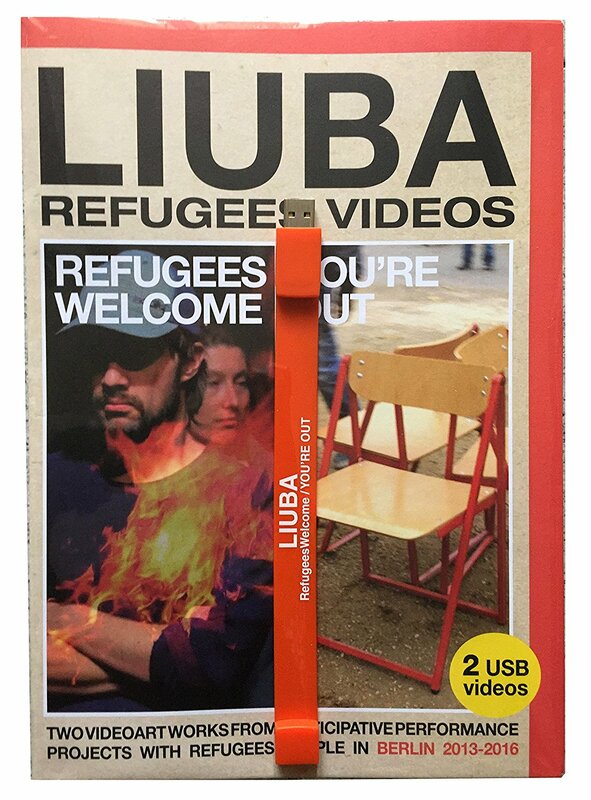 LIUBA REFUGEES VIDEOS is a special edition that comes with an USB Braceket Key with the two videos of the Refugees Project, wrapped-up in a newspaper–sized original poster with info about the project and the videos. The decision of creating an unlimited edition of the Refugees Videos starts from the desire to make videos available outside the contemporary art circuit, filling the gap between creation and fruition that often limits the circulation of video art. And, most of all, because this topic is now so important that also art must be a ‘voice’ into the debate. The proceeds from the sale of the Unlimited edition of those videos are re-invested by the artist in support of refugees. 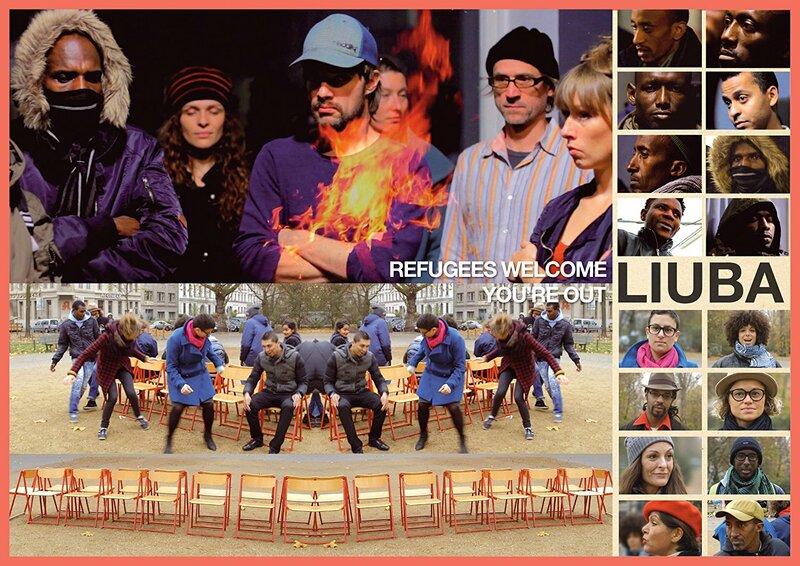 The two videos – Refugees welcome and YOU’RE OUT – are part of LIUBA’s series of participative performances made with Refugees living in Berlin. Refugees welcome is about Refugees, their stories and their rights. 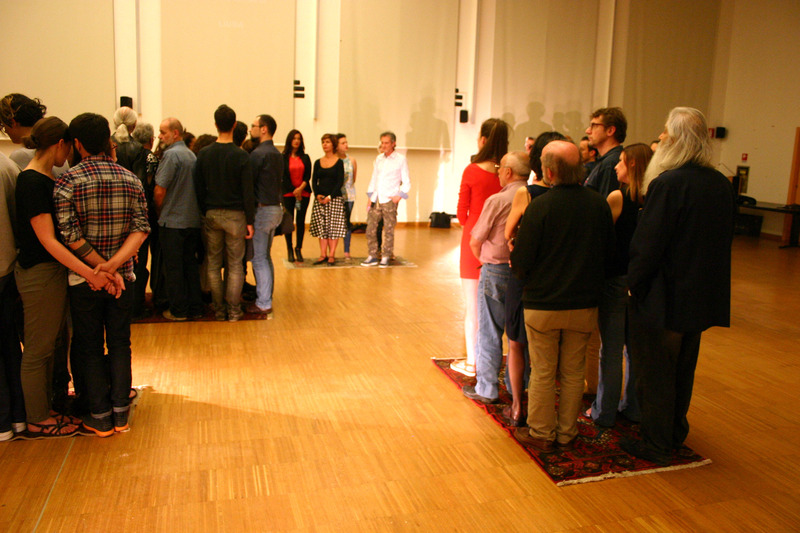 It was first performed at Kreuzberg Pavillon in Berlin on December 14th, 2013: in this occasion LIUBA invited Refugees people to the opening for 12 minutes of silence. The performance is only the ‘iceberg point’ of a long relational process. YOU’RE OUT is focusing on the European Refugee Problem and comes from a live performance with refugees and citizens. The idea is to play a game, the one that every child knows called ‘The Musical Chairs’, that is symbocally a mirror of what happens in reality: there is not always enough space for everybody. 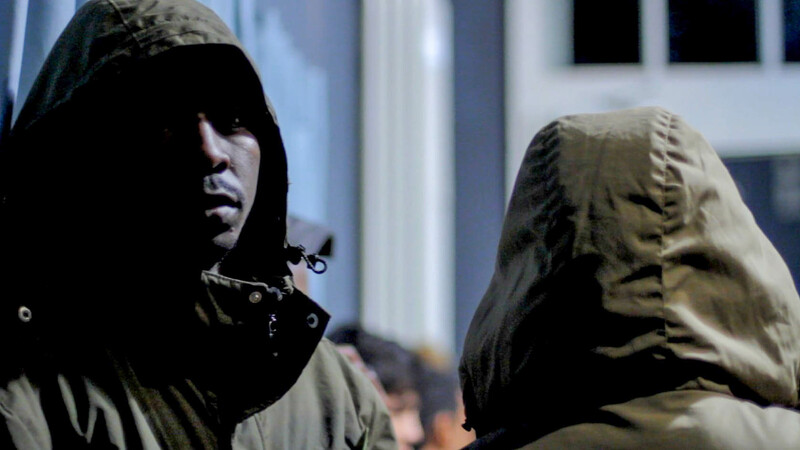 The performance was first realized in Oranienplatz (near the refugees information tent) in Berlin on November 16th, 2014.